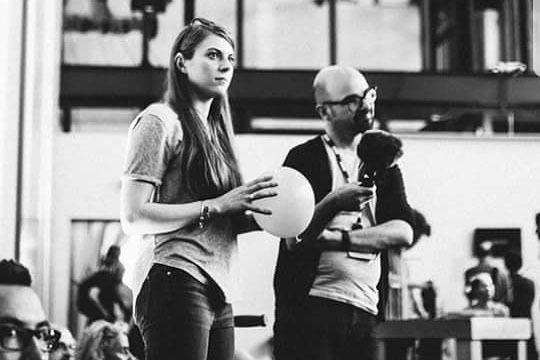 A deaf music graduate from City, University of London will present a documentary for BBC Radio 4 that explores the topic of music and deafness. Eloise Garland travelled to Brussels for the programme to attend an exhibition that featured instruments designed to be accessible to all. The City alumna, who completed her Music BMus degree in 2016, also met other deaf musicians from different backgrounds and spoke to them about their experiences and compositions. Called The Art of Living: Listening Without Ears, the programme will feature experts and other people who are deaf as they discuss the subject of music accessibility to those who are hard of hearing or deaf. 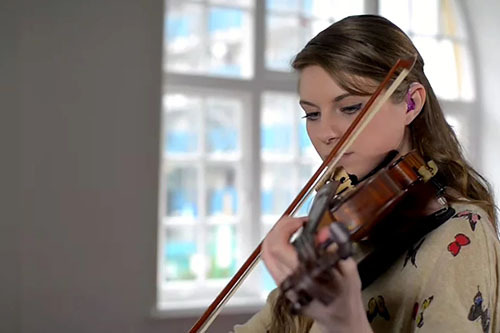 Eloise, a classical singer, violinist and pianist, said: “As a deaf musician myself, I have thoroughly enjoyed exploring this topic and it has been a fantastic opportunity for me. “The documentary follows me to Brussels where I attend a unique exhibition and performance, named Within, at the Kunstenfestivaldesarts by artist and musician, Tarek Atoui. “His performance features a number of experimental 'instruments' designed to be accessible to all performers and listeners – including those who are deaf. The documentary, The Art of Living: Listening Without Ears, is due to be broadcast on BBC Radio 4 on Tuesday 12th December at 11.30am, with a repeat on Saturday 16th December at 3.30pm. In 2016, Eloise performed at the House of Lords with Music and the Deaf's FORTE Ensemble as part of the Year of Sound concert. Image credits: 1) Caroline Lessire. Eloise Garland at rehearsals at Tarek Atoui's Within project in Brussels (top right); 2) Phonak. Eloise Garland plays violin.